Spring is in the air and Aries season is upon us. Take this weekend and make it really clear to the universe what your intention is. What is your wish? What do you want to see happen? What do you want to manifest? Use this extra push from the universe to breathe some life and love into whatever it is you are working on. And if you are working on love? Make your love known. Spring is a fertile time, I see people making all kinds of love connections. Some of you might enter into a new relationship. Others might be taking a relationship to the “next level”. Some of you might want a quality relationship to come into your life. If you feel inspired, grab a red candle and do some candle magic. Purify your candle with rock salt and carve your initials on the bottom of your candle. Before you light your candle, think about your wish from an honest place. What do you have to offer? What do you have control over? What do you want for yourself? Write down or speak your intention. Candle magic is for elevating your positive intentions and attracting good things to you based on the good you put out in the world (like vibration attracts like vibration). A word of caution: when you want things to work out in your favor with another person have some boundaries with your magic. You are not “compelling” people to fall in love with you or your work (free will y’all). You are asking the universe to assist you with having others notice all of the good things about you, because you are a quality high integrity human worthy of a love connection. You are in a really good position. There already is interest, as long as you do the work, the love and passion are there, and so is the stability. Don’t water your feelings down with reserve or hesitancy. Now is the time to make your feelings known. To make your passion known. The love that you feel needs to be expressed. You have something of quality to offer and the people in your life should bear witness and appreciate all that you are. You have so much to offer. There is an element of risk-taking when you expose your true feelings. The only thing that means anything is the purity of your intention. When you thing about relationship, you might want to feel on top of the world and hope to stay there, but the strength of any committed relationship is the ability to weather the storm. Whether that is an emotional storm or a financial one. Who is going to be there for you? Will they cut and run when the spring bloom falls off? Or will they remember that life is cyclical and there will always be challenges and storms to weather just as there will be beauty, fun, and romance. What do you want this to turn into? Are you finally in a position to let it all hand out? When you love yourself others can’t help but see that loving glow and admire and respect the person you are. A healthy self-esteem is the best kind of love magic you can find. I also see someone who is really grounded and solid. This person is good with money and a community connection builder. Stay open to new relationships for business and friendship. You never know who might be able to assist you on your path. Are you ready to connect? When you subscribe to my blog, you will receive messages from me about tarot card meanings, living life with intention, creating easy and intuitive rhythms and creating healthy boundaries. My life work, in a nutshell. Is it yours? We can work on this stuff together! © Copyright 2019 Traci A. Goodrich | Tarot for the Times. All rights reserved. 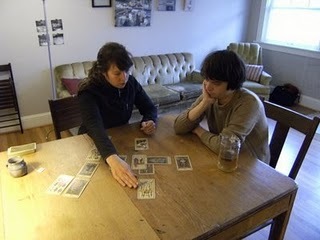 Here’s a picture of me reading tarot for a friend way back in the day. Hello! My name is Traci. Tarot has been a part of my life since the early 90’s and I’ve been a professional tarot reader in Portland, Oregon for over 15 years. I created this blog to explore the intuitive process using the tarot, moon cycles, astrology and the seasons. I look at tarot as an art form, it’s deeply personal, so, for me it’s process over perfection. Sometimes my style is quick and dirty because that’s what gets the job done. A journey with me can be in fits and starts. It’s more about exploration.